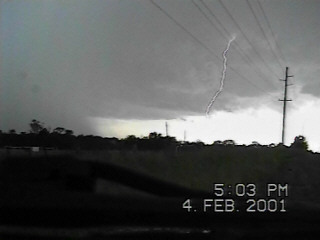 4th February 2001 - Severe storms Southern Highlands, Picton and Appin. Pictures without dates are clickable for larger view. A great little chase today. It was one of those marginal days when convection only occurred on the ranges west of the Illawarra Escarpment. After checking radar and making sure I had a decent chance I left home about 3pm striking out towards Robertson. On top of the infamous Macquarie pass and it had become apparent that the better storms were in the Bowral area. At Bowral and there was overflowing gutters everywhere, flash flooding would have been possible given the amount of water. Not much in the way of lightning at this stage. 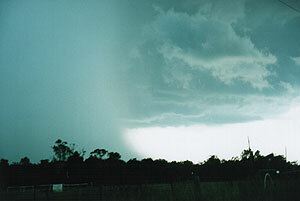 Another storm took my fancy north of Bowral and having to be home by 6pm I headed for Picton down the freeway. About half way to Picton a huge rain free base became visible. At the Picton turnoff I stopped and took some pictures. This developing storm was aided from the outflow of the earlier storms over the highlands. Now the storm had intruded onto the edge of convective activity were conditions were at least 5C warmer and much more humid, but more heavily capped. To the east and north east towards the Sydney basin the skies were clear and cloudless. The main area that had my interest was due east of Picton in the Appin area. The road to Wollongong heads SE, not a good option as it would take me into the older part of the storm. I was still surprised by the low frequency of lightning from such a ominous updraft base. 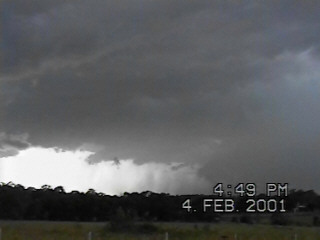 ( See first video still ) I headed to Appin and conditions over the next 10 mins intensified rapidly. I pulled over to get some pics of a small microburst to the west, CG's within 2 km of me started to become very active. At first it was one every 20-30 seconds, but before long it was a very close CG every 3-4 secs, thunder was booming constantly. 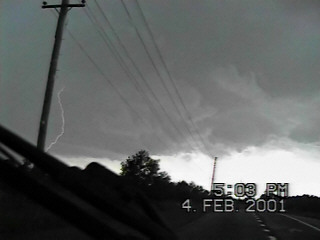 I actually retreated to the safety of the car that's how frequent the lightning became. From Appin I headed home and arrived home under decaying orphaned anvil with just a little steady rain.